On May 1, Lesmore Smith was re-elected BVI Horse Racing Association president, at a time the organization is facing its biggest series of challenges since the improved Ellis Thomas Dows facility opened in 1998 as the Little A. Racetrack. The floods of August 7, 2017 cancelled the 19th edition of the Premier’s Cup for the first time in history, then on September 6, powerful Hurricane Irma destroyed the grand stand, stables and perimeter fences. Smith, who has been head of the organization before and owns Top Priority Racing Stables, knows the task at hand and is focused on rebuilding an industry in which he sees lots of potential for growth. Currently, Smith said stables are being repaired and he has received a number of used poles from the BVI Electricity Corporation, plywood from Digicel and engaged workers to do the job on his own. He said with a number of horse owners, they’re working on weekends. So far six of 20 stables have been repaired. They’re hoping to have all completed by month’s end, then will look at the quarantine barn, to assist USVI horses. Smith said they already have some sand and have begun putting it in place. They have received assistance from Autland Heavy Equipment with a huge sifter and other backhoe operators who will give a hand along with the government’s grader to help level it off. 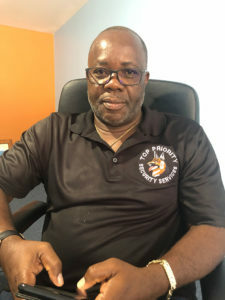 Since being elected president, Smith said he has reached out to the St. Thomas Horse Racing Association and he’s hoping to soon meet with them to open dialogue, set race schedules so there won’t be any conflicts. He commended former president Patsy Lake and has been in consultation with her on the plans being worked on. As she’s working on restoring her damaged buildings, she has pledged her support where she can. Plans are also to run the August Festival races which will mark the 20th anniversary of the tack surface. Smith is joined on the horse racing executive by vice president, Karen Aaron; treasurer, Elieen Parsons; secretary, Rosalind Leonard; racing Secretary, Carl Thomas; public relations officer, Xavyrna Samuels; Horse Owners representative, Kyle Abraham.